When Jay gave a ride to a friend who wanted to join the Army Air Corps in early 1942, he never imagined he’d be the one who would eventually be flying lead on missions over Germany in 1944 and 1945. On that fateful day while Jay waited for his friend, the sergeant in the waiting room handed him a stack of papers and tests to fill out. Although Jay balked at the expected timeframe of two to three hours – he had to get back to work – he tackled the tests and finished in 20 minutes. When the sergeant graded the papers, he was astounded that Jay had aced the tests. Soon Jay found himself going through physical exams before returning home. It wasn’t until the fall of 1942 that he was invited into the Air Corps’ cadet program. After a few months cramming a university education in Minnesota followed by primary, basic and advanced training, Jay moved to B-17 bombers. Seeing the huge plane for the first time up close, Jay could hardly believe such a massive plane could actually fly. It wasn’t long, though, before Jay was flying it, and well. A natural pilot, Jay and his crew won the top award when graduating from the B-17 training at Rapid City, South Dakota in September, 1944. Jay and his crew picked up a new B-17 and flew alone from the heartland to New England, Goose Bay, Iceland and finally England. Assigned to the 384th Bomb Group in Grafton Underwood, Jay flew his first mission on November 1, 1944 over Gelsenkirchen, Germany. By their 10th mission, Jay and his crew in the SCREAMING EAGLE were flying squadron deputy lead, and soon thereafter group and finally wing lead. On the 14th of April, 1945, Jay and his crew flew their 30th and last mission over Royan, France, their only mission NOT over Germany. Jay flew an additional 11 missions in a B-17 stripped of armament to analyze captured airfields in newly-liberated territory, or supposedly newly-liberated territory. One time, when he saw Germans diving for their guns in their revetments upon his landing approach, he decided landing there would be premature and returned instead back to England. After separating from the Air Corps, Jay built the Bellflower Airport before going on to produce in Hollywood and own multiple car dealerships nationwide. 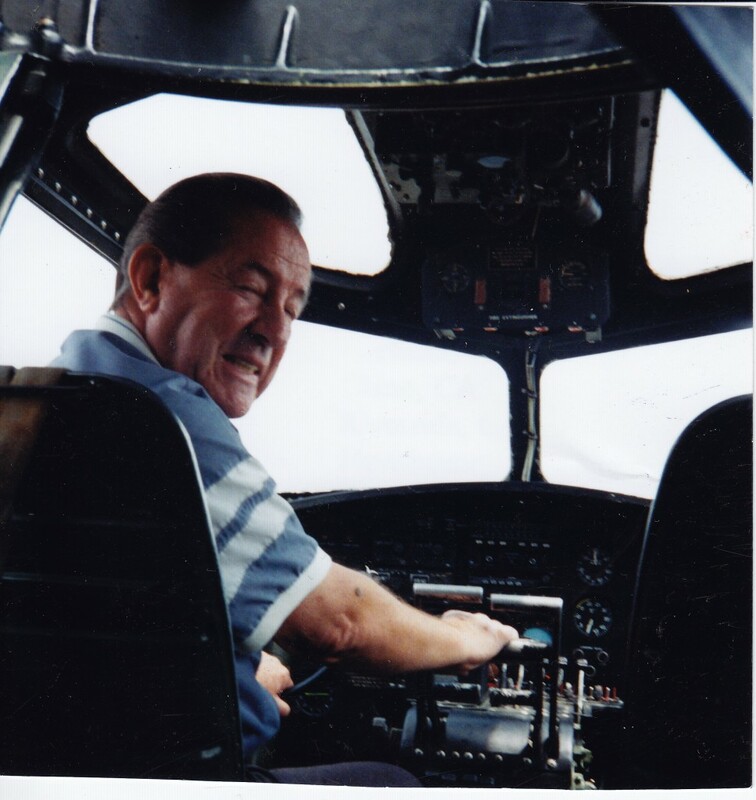 He served as an Ambassador-at-large after the war, and flew a restored Collings Foundation B-17 across the country for many years while in his 70’s. Jay was president of the governing board of the World War II History Project. He passed away on May 2, 2016 and will be sorely missed.